There is a phenomenon known all too well by dentists in private practice – the predictably unpredictable dental emergency that requires immediate attention. All too frequently, the patient who calls my office with an urgent problem, had an inkling that something was amiss for quite awhile. But he or she often delayed making the call in the the hopes that said problem would dissipate given enough time. Yet, when necessity dictates immediate action (i.e. “I can’t take this pain any longer!”) and the call for help is made, yesterday is never soon enough. The patient in acute distress is ready to drop everything to get relief, regardless of time demands. My office staff will “move mountains” (or at least juggle the schedule) to make me available. A severe toothache can be a harrowing experience, and is in many ways unique from your body’s other aches and pains. The intensity of tooth pain can be extraordinary with severity rivaling true neuralgia (intense neurological pain of almost unparalleled proportions). The face and head, including your teeth, are richly served by the nervous system and make for an exquisitely sensitive and responsive anatomic region. This is one of the “benefits” of being at the top of the evolutionary ladder. For all that make your teeth especially sensitive to painful stimuli, they are also much like any other part of the body; namely, they can experience transient discomfort that can dissipate almost as quickly as it arises. Aches and pains are a part of an active lifestyle (at least for those of us over 40!) so why should teeth be any different? I’m sure you are familiar with the a sudden wince when biting into something unexpectedly hard, or the piercing jolt when chewing ice cold fruit or taking too big a mouthful of ice cream. But equally familiar is the agony of a stubbed toe. In most cases, no real damage is done, but the painful sensation is no less real. A stubbed toe need not be broken to hurt and similarly a traumatized tooth that encountered a foreign object during the chewing cycle need not be cracked (as in broken or split) for you to experience pain. With all of that said, your teeth are unique “organs.” Within the body of each tooth lies the dental pulp, commonly thought of as the nerve of the tooth. In actuality, the dental pulp is more complex than that. It contains specialized cells that form tooth structure, blood vessels that nourish the tooth, connective tissue, and nerve fibers. Unlike other parts of the body, the delicate blood supply to the dental pulp is limited by a tiny opening in the tip of the root and the rigid walls of the tooth itself. But teeth do not respond to trauma in the same way as other parts of your body. When you stub your toe or bruise yourself, the injury is mitigated by a robust blood supply that aids in the inflammatory and healing response. Swelling is a natural part of this process, which in time will recede, in large part because of the increased circulation to the area. But because your tooth is a solid closed container, the blood supply is restricted and confined. If the injurious insult such as a broken filling, a chipped tooth, or early to moderate decay, is not too severe, the dental pulp may be able to respond adequately to the challenge and maintain its vitality. On the other hand, if the trauma (severe physical damage, deep decay, gum disease, etc.) is extreme, your tooth’s circulatory system is not flexible enough to cope with the noxious threat. This can lead to cell death, pulp necrosis and even abscess formation (infection). Yuck. What’s more dental nerves do not feel heat, cold, sweets, or touch. When the dental nerve is stimulated, its response is pain. While dentists may test a tooth’s status by using various stimuli including thermal testing and biting pressure to diagnose a dental problem, any reaction to such stimuli is pain. What stimulus the tooth responds to and how long the discomfort lingers is often diagnostic to the status of the pulp/nerve and helps determine the appropriate treatment which can be a bite adjustment, desensitizing application, a filling, a crown, the root canal, etc. 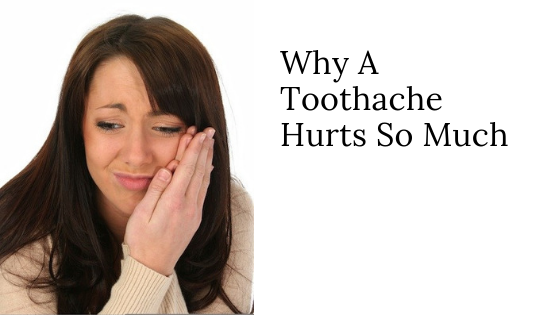 I written numerous blogs about dental issues including tooth related problems (5 Ways To Get Relief For A Toothache, Cracked Tooth Syndrome, 7 Home Remedies For A Toothache, to name a few) which have brought thousands of visitors to my website. Consequently, I have also been the recipient of hundreds of comments from people around the world who are dealing with dental emergencies. The vast majority of these correspondences are questions about pain and what to do about it. Of course my responses only can be of a generic nature because I don’t have the luxury of a clinical evaluation, but the urgency, and often the desperation, conveyed is troubling. I can only offer what I believe to be useful information, professional guidance, and encouragement to seek dental care. Unfortunately, what I am unable to offer is a dental miracle. Dental pain can be disabling. When confronted with a toothache, a visit to the dentist is warranted. And while this may seem self-evident, many of the inquiries I receive express trepidation about seeing a dentist. In fact, national statistics demonstrate a steady and dramatic rise in the number of dental emergencies being seen in hospital emergency rooms, as opposed to dental offices or clinics. Not only is this a more costly approach to dental care, it is largely ineffective because hospitals will usually only dispense pain medication and antibiotics without treating the actual cause of the problem. Emergency relief of tooth pain can be likened to first aid with definitive care (root canal, crown, extraction, etc.) being deferred until after the immediate crisis is alleviated and it is best performed in a dental office. If you are suffering from a toothache, please seek a dentist’s care as soon as you can. I feel your pain.